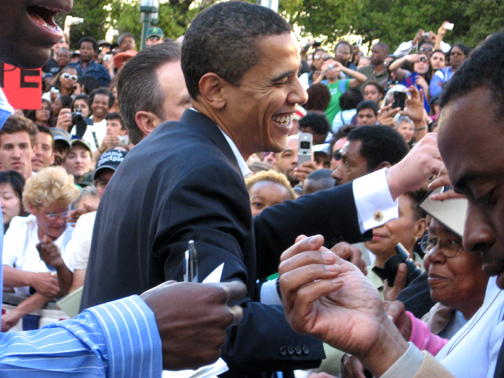 Folks were lovin’ Sen. Barack Obama Saturday afternoon in Oakland when they finally got inside the enclosed Frank Ogawa Plaza area. The police presence was minimal, volunteers everywhere in green Obama 2008 t-shirts on a lovely St. Patrick’s Day. The sun played hide and seek – water distributed by volunteers to those who wanted refreshment. It was truly a day to remember – like a first kiss or marriage proposal. The courtship short and sweet. Everyone was there: Kamala Harris, Eva Paterson, Oakland City Council members, county supervisors, state Assemblyman Sandre Swanson. I was seated between Baba Eddie Abrams and Shelah Moody, in front of a former West Oakland neighbor, a member of Haiti Action and Willie Ratcliff, our publisher. Though the rally for the 2008 presidential ticket started an hour late, folks stood in the sun grooving to the old school music provided by the live band, which was very good – some of its members homegrown. Mayor Dellums came out first to welcome the senator to his city including in his greeting that of Barbara Lee, who stood. Both the mayor’s protégées, Lee and Supervisor Keith Carson, were seated nearby. Obama was introduced by a veteran from Oakland. I don’t know what neighborhood he grew up in or what schools he attended. I don’t know why he enlisted in the first place and what he did in Iraq. I don’t even know why Obama chose him to speak, a white man in a Black town, but anyway, he was there and he introduced Obama who came down the center aisle from City Hall like Mr. America, shaking hands as people went crazy – Vote for Obama placards waving, his name spelled out on cards. It was quite the frenzy. During his talk he paced the stage greeting everyone near and far away – his body language inclusive. He had no notes and his talk referenced his decision to run, the climate in the country that made this inevitable and why we should vote for him. He talked about the campaign trail, one his family was on with him, and the America he loved, one which was driven by the people, a people who don’t lie down and roll over just because the president tells them to. He mentioned the war and that he’d voted against it and a bill he has introduced which calls for the withdrawal of the troops beginning in May 2007 and finishing by July next year. He also stated that by the end of his first term there would be universal healthcare. Just in front of me, Bay View publisher Willie Ratcliff jumped up frequently, arms raised in agreement with Obama as others joined him all around me in the reserved dais. Hundreds of others encircling the seated area. T-shirts were on sale for a donation, buttons and bumper stickers. By the time I made it to the table, all the souvenir items were gone. They’d given out placards which Obama signed for those near enough to get his attention. He was the perfect celebrity – reporters who’d been denied access to the pit jumping on the speaker stands to get shots of the senator up close despite the calls from security to move. I don’t know why it always amazes me when the Black press is denied access. All the press allowed inside the enclosure were white mainstream media outlets, not the Black press. One woman tried to evict me and Baba Eddie Abrams from our seats twice, yet said nothing to media representatives behind me taking up an entire row with their cameras and notebooks. I just don’t know sometimes about our folks. Bay View Arts Editor Wanda Sabir can be reached at wsab1@aol.com. Visit her website, www.wandaspicks.com. Next articleThreat to Internet radio affects local stations – don’t let it happen!